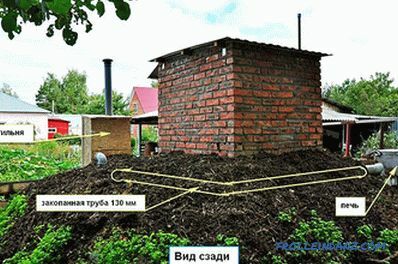 Having built a house, many people begin to wonder how to make heating in it. It should be noted right away that such an approach is fundamentally wrong, since it was necessary to take care of this even at the planning stage. This is because if you want to install a single pipe heating system with polypropylene pipes, it will not be so easy, and you may have to destroy what has already been done. This concerns not only making holes in the walls, but also shaving the floor, as the desire to make the housing not only warm, but also beautiful, by laying the pipes in such a way that they do not spoil the design of the heated room, is understandable. The peculiarity of the one-pipe heating system is that there is a pipe from the boiler, the second end of which again comes to the boiler. 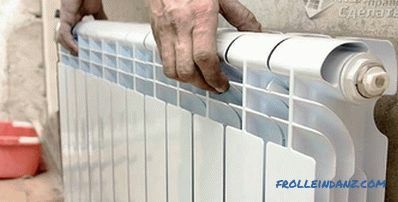 Without breaking the main line, radiators are connected to it. Both systems can be both closed and open. As already mentioned at the beginning of the article, one of the advantages of a one-pipe system is the ability to hide communications in the floor. 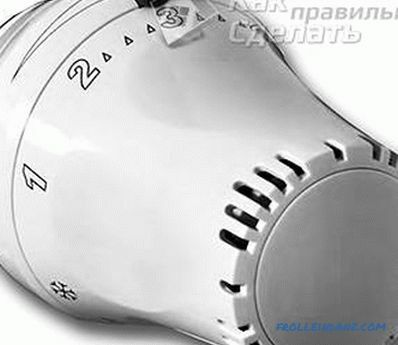 This is an important factor, because nowadays there are few who hide heating radiators behind the curtains, and this is not practical, since the air circulation around the batteries is disturbed, as a result of which the temperature on the boiler has to be raised, and this leads to unnecessary fuel consumption. If there is no counter-slope or height differences in the assembled system, then it can work without a pump. The installation of a single pipe system is carried out with a smaller number of pipes (30-40%). A simple wiring layout that a layman can perform. Compared to a two-pipe heating system, one-pipe installation is faster. The system can be mounted both in a one-story house and a house with several floors. There are no problems about how to bypass the doorway when installing pipes. After talking about the advantages, need to mention and disadvantages. Each battery must have a Mayevsky valve or an automatic system for bleeding from the air system. 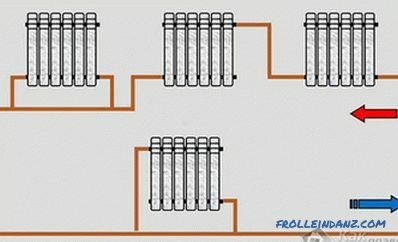 Uneven distribution of coolant - each next battery comes with more cooled water, therefore the efficiency of the last radiator will be low. The position can be improved by installing a circulation pump in the system. Not every person can use computer programs for modeling in a 3D projection of his house, which would undoubtedly be very convenient. Given this nuance, we will consider how to make a plan manually by writing everything on a piece of paper. 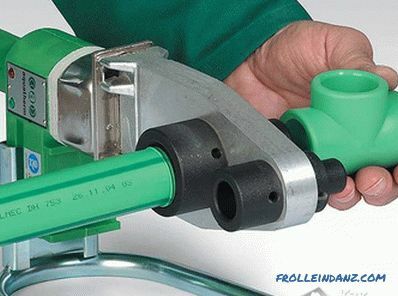 When making the scheme, you need to take into account the peculiarity of the installation of the system of polypropylene pipes - it is impossible to make smooth turns in it. 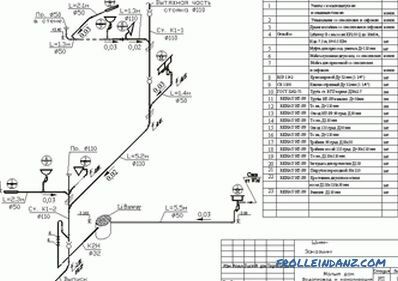 When making a drawing, you need to take into account that the highway must be laid with a slight incline - at least 0.5 cm per 1 meter of pipe, otherwise it will not work without a pump. We decide on the installation site of the boiler. If for some reason the pipes cannot be hidden in the floor, then it will be necessary to carry out external installation or partially hide the pipes in the floor - in the place of greatest deprivation. In the diagram, we mark the places of installation of the batteries, noting how powerful they should be. Determining how many sections will be needed for the room, you need to take into account that each subsequent battery heats weaker, so you need to increase the number of sections of composable batteries (or area, if the radiators are steel). If taps, thermostat, etc. are installed, this should also be reflected in the diagram. With the full picture, you can calculate how many pipes, fittings and those elements that are planned for retrofitting need. 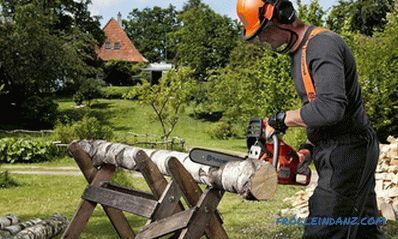 shaver (if you purchased pipes with external reinforcement). All-polymer products are suitable only for water supply. 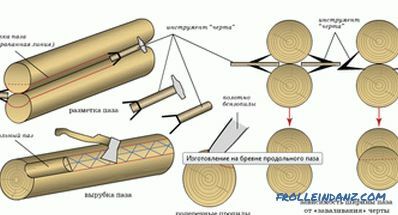 You need to purchase reinforced pipes, the characteristics of which allow them to be used for heating.Best of all, if basalt fiber or aluminum foil is used as a reinforcing layer, then the elongation coefficient of the pipe is threefold reduced, in contrast to products with fiberglass. From the window sill - 10-12 cm. From the wall - 3-5 cm. From the floor - 8-12 cm. When purchasing batteries, these requirements must be taken into account. 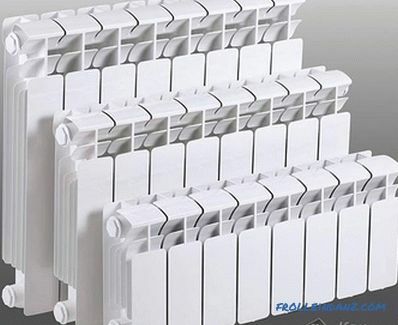 To learn how to find out how many battery sections you need to install for one room, you can read in the article on bimetallic radiators. Using horizontal markings, you need to mark the places where the fasteners will be installed with such a distance that the installed fastener is between the sections of the installed battery. A hole is drilled in the wall into which the fasteners are installed. Now you need to prepare the batteries. If they are covered with a film from the factory, then it does not need to be removed yet. In keeping with the plan, we install air vent valves, thermostats and ball valves. We hang the batteries in their places and use the building level to check their horizontal position. Next, the pipes are soldered. It is important not to forget that it is necessary to observe the slope of the main highway. 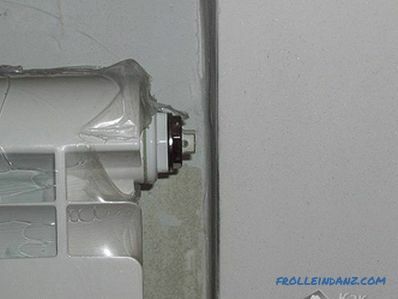 It is better to install a bypass with a pump on the return pipe in front of the boiler. It is imperative to install an expansion tank and a unit with elements of a security group. The one-pipe heating system does not have to be filled with water from the lowest point, since all the same every radiator will have air to be vented. If an automatic air vent system is installed, they will cope with this task. It remains to start the boiler and check the performance of the one-pipe system assembled by hand.